A transmission shop near Detroit ripped me off once. It cost the owner a few hundred dollars and the Big Three several million. 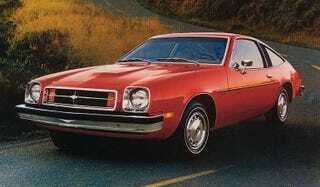 I owned a 1979 Chevrolet Monza which had a manual shift transmission. I bought it from my brother. Besides being pretty good at bodywork , Dave was also a pretty good mechanic. He had recently replaced the clutch on the car before he sold it to me and the car ran great. One day I was driving along and something in the shifter linkage came apart. It wasn't in gear – I had been stopped at a light – and nothing I tried could get it back into gear. At the time I had not done as much with cars but I knew it was the shifter. I pushed the car into a parking lot and called for a ride home. I opened a phone book and saw an ad for a transmission shop which was a couple blocks from where I worked. They offered free towing. I called them and they said they'd get my car and call me as soon as they looked at it. The next day the man at the transmission shop told me the trans needed to be rebuilt and, "The clutch is shot. It looks original. But it will cost less to do since we already have the transmission out for the rebuild." He quoted me an estimate for the job which was a bit over $600. Keep in mind that this was 1985. I told my brother and he suggested we go to the shop and take a look. Among other things, if they had the clutch out, it would obviously not be the original clutch. It would be the one he had just put in recently. When we got there, the owner called us into his office. Before anyone sat down, Dave asked to see the transmission. The owner balked. Why would you want to look at a pile of car parts? Dave insisted. We walked back into the shop area and there was my transmission, all torn apart, sitting on a bench. "Where's the clutch?" Dave asked. The owner looked around and saw a few clutches sitting on a different bench. He picked up the most fried-looking. Dave looked at it. "That's not the clutch from this car." The guy looked at it and then back at the bench. He picked up another one. "Is this it?" This clutch was not fried. "Yes. What's wrong with this?" "Well, we have the transmission out." He pointed. "While we have it apart it just makes sense to do the clutch and the throwout bearing." I stood to the side, wondering if my transmission would ever be properly assembled again. I walked over and took a closer look at the transmission. The front of the case normally had four flanges where it bolted to the bell housing. One of the bottom flanges was cracked off and missing. There were only three flanges and where the fourth one had been, there was shiny metal. It had been cracked off recently. I caught Dave's eye and pointed at the cracked flange. Dave walked over. "I see you guys dropped the transmission when you removed it from the car." "Oh that. It's no big deal. The trans only needs three bolts. We put them together like that all the time. Three will hold it forever." At this point, there were no good options. We knew the guy was incompetent and a liar. But he had my car in pieces. What would someone else charge to fix this guy's mess? He told me his work had a "Lifetime Guarantee" or some nonsense so I agreed to let him put it back together. A few days later, the car was done. I went and retrieved it and drove it home. When I parked, I immediately noticed the transmission leaking. I drove it back to the shop. The man did not seem concerned and told me to leave it. The next day he gave it back to me. I leaned under the car to see if it was leaking and I could see they had slathered the transmission case with something which looked suspiciously like caulking compound. I drove it home. When I got out of the car, it was leaking again. I returned to the shop. I was young, and not quite as refined in channeling my anger as I am today, but I made it clear to the guy the reason the trans appeared to be leaking was the missing flange/bolt and unless the trans case was replaced, this was never going to run right. He said he would replace the case. The car sat on the lot of the trans shop for a few weeks. Every few days I would call and the owner would lie to me, telling me the car was up on the hoist and they were working on it. I would walk over and see my car, unmoved, sitting where it had been the day before, covered with another day's dust from the shop's dirty parking lot. I would then walk back to my office and call again. Once, the owner told me I was confused; I must have seen another red car because mine really was up on a hoist. I went back over to the place and walked inside. I could see the two hoists were empty and we could see my car in the lot. He told me he was having a hard time finding a transmission case for the car. He meant he was having a hard time finding one cheap. A couple days later I noticed my car was inside and they finally called me. The car was done. When I went to pick it up I climbed underneath it and confirmed that it was held on with four bolts. I took it and it ran fine. I filed a complaint with the state Attorney General. I also filed a small claims court action. My argument was that the original problem had been the transmission linkage. The transmission didn't need rebuilding and the clutch didn't need to be replaced. I was entitled to most of my money back. A short while later, we were in court. I told the judge the whole story from top to bottom. Dave came in and testified about the repair he had done on the car before he sold it to me and about how we saw the trans with the broken case. The transmission shop owner told the judge his version, including how my brother and I had to be mistaken in almost everything because he was an upright businessman. The judge ruled in my favor and ordered him to return every penny I paid him. Every penny. He was unhappy with the result but he paid me. I have to admit I had fun during the process and the fact that I had gone to court and won was one of the things which inspired me to become an attorney and to handle consumer protection claims. The bulk of my practice is Lemon Law and I have handled several million dollars' worth of cases if you add up the value of all the cars bought back from my clients by the Big Three. In a roundabout way, this transmission shop can be blamed for that. But there was another very funny postscript to this story. The Michigan Attorney General launched an undercover sting operation called "Operation Shifty" a few years later. They sent undercover "customers" into transmission shops across the state, shops they had received complaints about. Their operatives were almost universally ripped off. Among other things, they caught a transmission shop removing a perfectly good trans from a late model car and replacing it with a junked one. When investigators descended on the shop with search warrants, they found their trans – which had been marked – in the shop's inventory on a shelf. Presumably, the shop was hoping to sell it back to the investigator. Many of the shops were fined and some were shut down. The one that did the work on my car was swept up in the investigation and eventually changed names. I've seen it over the years. It is still there and every few years it changes names again. I have no idea if the same owner is there but I suspect the place is still ripping people off, inspiring its customers to become attorneys. And the Big Three? They ought to hate this guy.